Take your BOLD tacos to the next level with two types of meat, two types of cheese and two handfuls of baby spinach! Place 1 tablespoon of Taco Spice Mix into a medium bowl. Add the onion rings and toss to coat. Heat half the oil in a large frying pan until hot. Cook the onion rings on medium heat for 5 minutes, stirring constantly until golden and slightly crispy. Remove the onion rings with a slotted spoon into a bowl and set aside. Add crushed garlic and remaining Taco Spice Mix to pork and beef mince and mix through to distribute evenly. Heat remaining oil in frying pan and add mince, stirring with a wooden spoon to break up any lumps, cook for 5 minutes. Add the tomatoes and ½ cup water and simmer for 2 minutes, or until sauce thickens and the tomatoes are soft. 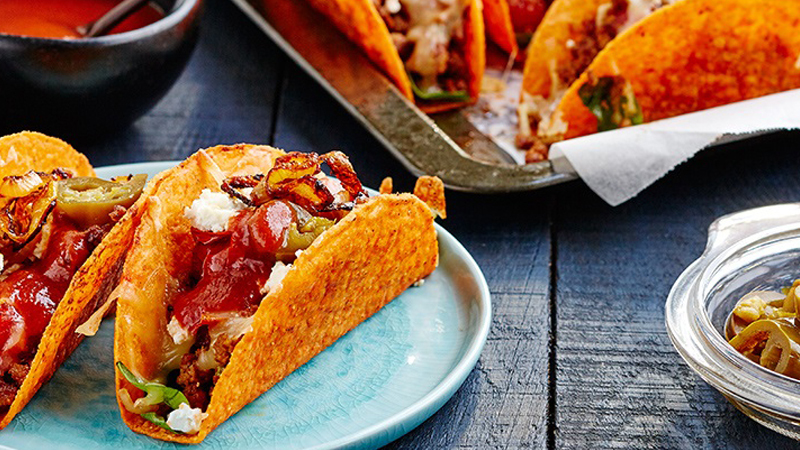 Fill the BOLD Taco Shells with the mince mixture, baby spinach and cheeses. Place the shells in a baking dish and bake for 5 minutes until cheese has melted and shells are crispy. Serve topped with Mild Taco Sauce, fried onions and jalapenos.